In hospital operations, accurate and timely communication is imperative, and technology has long played a significant role in streamlining this effort. Until recently, this technology has been cumbersome and at times unreliable. New tablet PCs, however, are streamlining communications and operations in the medical field, enabling real-time data transfer and making it more accessible – particularly important in emergency medical scenarios. In emergency situations, when patients are being transferred to the hospital, every step requires precise decision making and timing. Traditionally, magnetic status boards have been used to communicate patient status. This, however, only made information accessible to a few staff members and required constant updating. Winmate’s M970D rugged tablet PC eliminates the need for these boards, enabling reliable and streamlined communication between the main control room and medical staff. The integrated GPS allows efficient tracking and dispatching of ambulances, as well as real-time communication and data transfer between drivers and Emergency Medical Dispatchers (EMDs), improving ambulance operational efficiencies and patient safety. The detailed route information also allows the driver to focus on the road instead of administrative or manual tasks. Winmate's M970D is an all-in-one device, which means the same device may be used to facilitate communications between the ambulance driver, EMD, and designated hospital. The Intel Atom-powered rugged tablet can be securely mounted inside an ambulance with a customized vehicle dock, and swiftly dismounted upon arrival at the hospital. This allows for seamless transfer of patient information, making the transition period quicker and smoother. Winmate's multi-touch panel PCs go beyond that of the standard industrial panel computers with elegant, edge-to-edge design, rugged construction, powerful performance, and flexible mounting options. Whether used for hospital automation, point of information, access control, or patient room management, our advanced multi-touch panel PCs, enables rapid and reliable communications, efficient operations and increased security. Winmate's multi-touch panel PCs may be easily installed at multiple locations such as waiting rooms, hospital halls or nurse stations to streamline room management and organize hospital information. This reliable, 24/7, integrated system connects to a centralized database to provide real-time status updates patients and/or rooms. Standard consumer tablets are not designed to survive the hospital environment. To make the medical staff's assignments easier and more productive, a device must be light enough to be mounted anywhere, feature a touch screen with a large, easily viewable display, and include all the required peripherals (RFID or Barcode) to capture and track patient data. The M185D with Intel Atom N2600's Dual Core processor is a state-of-the-art industrial panel PC high resolution, a multi-touch screen, and extended battery life via the add-on battery, which helps prevent against possible data loss or system damage from sudden loss of power. The M185D features a compact design weighing less than 4.5 kilograms and just 35mm thick, which means it may be mounted just about anywhere. 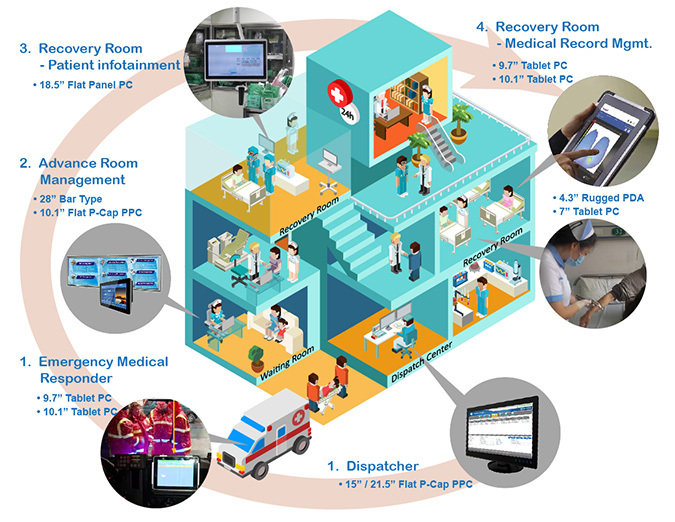 This tablet is ideal for the hospital and healthcare environments, with features like a fanless design, an IP65 front panel sealing, built-in smartcard reader, which protects data from being compromised by unauthorized users, and an optional barcode or RFID reader, and 2 MP camera to speed up medical staffs' daily work. Winmate's M700DM4 or E430RM4 provides health care professionals peace of mind when it comes to monitoring medical records and data, allowing them to focus on patient interaction. These rugged mobile technologies provide nurses a solution for monitoring multiple patients at once, while collecting data and transferring it to a central data center. This ensures medical records are up-to-date and accessible from any location. Winmate’s M700DM4 and E430RM4 provide multiple medical solutions, reducing paperwork errors with electronic medical records, real-time diagnostic data management in surgery, and patient identification. Doctors also utilize these mobile technologies to quickly access patient records on the go, eliminating the need to track down paper records. Built to withstand dust, liquid, and drops, these rugged tablets are ready to go to work in the demanding medical field. With hot swappable batteries, medical professionals are ensured continuous, reliable power while on the go. Advanced communications options such as WiFi, Bluetooth, and optional 3G/4G/LTE, enable records to be updated in real time. Winmate’s rugged tablet and handheld device are reliable and powerful solutions in the medical field for streamlining data collection and diagnostic data management, while reducing errors associated with paperwork. 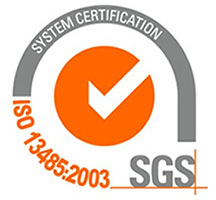 Winmate has also achieved ISO 13485:2003 and EN ISO 13485:2012 certification for its design, development, production, installation, and servicing of medical devices. What does this mean for you? Winmate's certification confirms any portable panel PCs and mobile tablets we develop for use in the medical industry are safe and meet all regulatory design requirements. This achievement will also enable Winmate to expand its medical-related product line, and create new opportunities for our original design manufacturer (ODM), original equipment manufacturer (OEM), and rebranding partners.